From February to the end of March 2014, the Museum of Finnish Architecture will host an exhibition presenting the Modern Movement Architecture of Tel Aviv. The exhibition was first shown in Tel Aviv's Art Museum in 2004 as part of celebrations following Unesco’s recognition of the White City of Tel Aviv as a World Heritage Site in 2003. Since 2005, the exhibition has been shown in Montreal, Mendrisio, Lausanne, Rome, Le Havre, Paris, Vienna, Brussels, Frankfurt, Sao Paulo and most recently at the Hermitage Museum in St. Petersburg. In Finland the exhibition will be organized by the Museum of Finnish Architecture with support from the City of Tel Aviv and the Embassy of Israel. The White City is spread along sand dunes on the shores of the Mediterranean Sea. Its designers studied in the avant-garde schools of Eastern, Central and Western Europe and received additional training from leading European architects such as Erich Mendelsohn, Le Corbusier and Hannes Meyer. The architects brought their knowledge and experience to Tel Aviv, creating a new architectural language adapted to the local climate in a blend of various European influences. More than 3,700 buildings were built in the International Style between 1931 and 1948. The aim was to make the buildings affordable to new immigrants, to adapt them to the harsh climate, as well as integrate them with the local architectural heritage. Within three decades, a modern Hebrew city was created. There are approximately 8,000 buildings in the historical part of the city; 1,600 of them are listed for conservation as part of the White City. Unesco recognized the area as the world heritage site with the highest existing density of early International Style buildings located in the city centre. The cubic and rounded forms and strong horizontal emphasis combine to create the play of light and shadow that has become a trademark of Tel Aviv architecture. 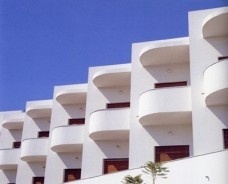 The shapes of the buildings are enhanced by the blazing sun on the smooth white plaster. The White City is a representative sample of purist architecture free of superfluous ornament. Today, these buildings are undergoing a “facelift”. Some will grow in height with the addition of new storeys adapted to the existing structure. All modifications will adhere to clear conservation guidelines in order to preserve the White City's character for generations to come. Since the Unesco nomination in 2003, the number of visitors to the city has grown considerably. The demand for real estate in the city centre has risen tremendously, as the lively area attracts young people from around the world. The initiator and curator of the exhibition is Professor Emerita of Architecture Ms. Nitza Szmuk together with architect Tal Eyal. The exhibition design and graphics are by architect Peter Szmuk. The exhibition and accompanying films were produced by Ms. Smadar Timor and Ms. Noa Karavan Cohen. The exhibition travels under the auspices of the City of Tel Aviv and Israel's Ministry of Foreign Affairs.